Say goodbye to Baby’s Colic. Motherhood definitely isn’t easy and has loads of hard times, but initially, they all pass and only good ones remain. As soon as that sweet little one arrives parents try to create the safest place for their newborn baby who is accustomed to living in her mother’s womb and now he/she is adjusting to this new world. We women find it difficult when we are new to the club of parenthood and blessed with first child and When the baby is crying it is really very hard to recognize why he/she crying? Since I do not breastfeed my son he is on powder formula, so it often results in colic and flatulence. There are times when he cries terribly with either colic or constipation. Colic is mother's worst nightmare and a child's most dreaded face as it involves sleepless nights and pain that cannot be described in words .I always wanted my baby to get instant relief without allopathic medications as it may take a toll on child's body. Few days ago jash got terrible constipation and was crying badly. 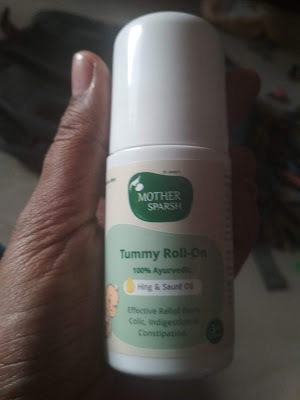 I tried almost everything but nothing worked out ,I was panicking a lot and then one of my friends suggested me Mother's Sparsh Tummy Roll on an #AyurvedicHomeRemedy . I had just applied it on the stomach near the naval area gently. It can be very easily applied as the roller ball is very smooth. He got relief in just few seconds #ColicRelief #ColicFreeBaby #MotherSparsh Tummy Roll On is 100% Ayurvedic which is formulated with natural herbs that help to treat colic and indigestion in babies. This product is prepared under the supervision of experts and experienced doctors. This Tummy Roll On is a combination of Hing oil and Saunf Oil that provides relief – from stomach discomforts caused due to gas, acidity and indigestion in infants and children. Hing Oil has antiseptic and antibacterial properties which help to reduce acid reflux and constipation. The presence of fennel oil in this roll on has anti-colic properties which helps to reduce stomach bloating, gas and also helps the baby to burp. This Roll on is 100% Ayurvedic and contains no alcohol, preservatives or any other harmful chemicals. All the ingredients present in Mother Sparsh #TummyRollOn are natural and free from toxins which make them totally safe to use on babies sensitive skin. According to me it's a very effective product and it is very light in weight and so #MotherSparshRollOn #HingRollOn is travel-friendly as it is convenient to carry while travelling in bags, purses, pockets, etc. I always carry it with me so that it can help me in times of emergency. Being a mother, I am very concerned about the packaging of the product. Whether it is a wipe or tummy roll on, Mother Sparsh is giving their product safely which you can store likewise for a long time. It comes in a paper box and under this, you can get a roll on with proper cap so that you can use it whenever you want and caped it again. There are no side effects as it is completely natural and free from toxins. It is completely value for money as it is effective and works in only few minutes. The brand has secured a fine place in my home and in the life of my children. I am blindly trusting to the product of the company as it has all the right and natural ingredients. 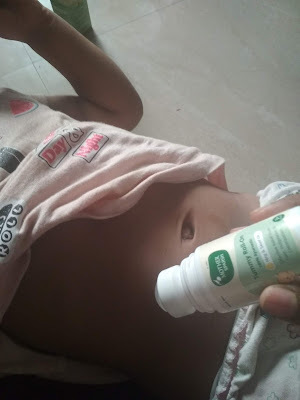 I have used this product for the discomfort for my kid and it has shown the amazing result in short time. I am extremely happy with the way this product works and will highly recommend you all to buy this product for your babies #BabyCare #HappyBaby #Parenting.